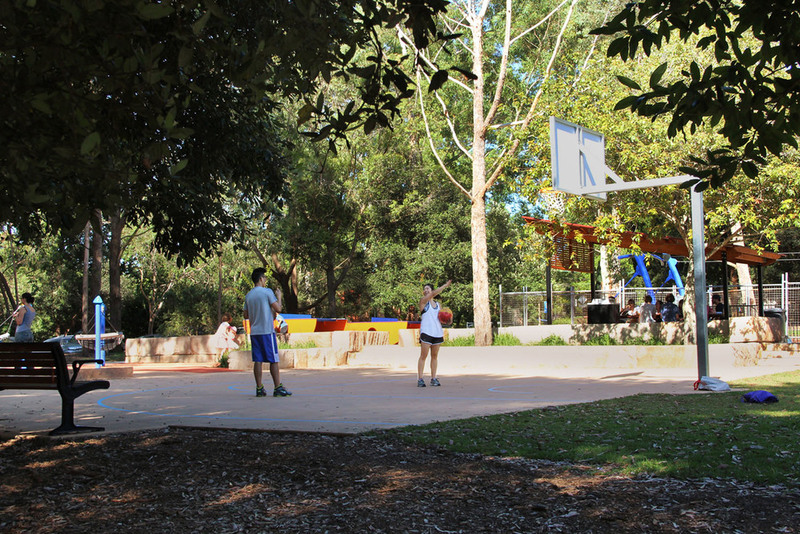 We were engaged by Ku-ring-gai Council to provide landscape design and documentation for a new recreation precinct within Turramurra Memorial Park, which is an important district sports and recreation area. A master plan, which was prepared by Council after extensive public consultation, included development of a new recreation facility for children and young adults. Create a play area and gathering space for older children. Work within the existing EEC tree community and minimise the impacts on tree to be retained. Build on the existing visual character of Turramurra Memorial Park. Enable connections around the site to be developed whilst retaining major spaces and separate use areas. Deliver the new facilities within budget and with minimal on-going maintenance costs. We carried out a detailed site assessment to identify constraints and opportunities presented by the site. Large mature trees presented particular challenges in relation to the extent of their root systems. We then prepared a full set of construction drawings as well as a NATSPEC specification. An opinion of probable cost and Bill of Quantities were prepared by BDA who were engaged as sub-consultants. seating areas and upgraded play equipment. Rubber impact attenuation paving was installed below all elements of play equipment to meet the relevant safety standards. Providing accessibility to the facilities for all levels of personal mobility required the incorporation of ramped sections of path. In order to meet budget constraints the design incorporated sandstone ‘logs’ which are blocks pre-cut to standard dimensions. A number of existing trees were incorporated in to the design with native grass planting. Additional native species trees were planted to provide shade in the longer term while planted Crepe Myrtles will create a visual feature when they are in flower. The new facilities were successfully completed and are now heavily used by all age groups.